I got my first chance to see a Kindle 3 in person yesterday at Target, and I have to say I was impressed. Even though I’ve talked about the K3 before, and pointed out how it’s 21% smaller and 15% lighter than the K2 that I own, seeing (and feeling) it felt like a bigger difference than the numbers indicate. The K2 is already thinner and lighter than most paperback books (at 10.2 ounces), but the K3 felt feather-light and paper-thin in comparison. Weighing in at only 8.7 ounces (8.5 ounces for the Wi-Fi-only model) and less than 1/3rd of an inch thick, the K3 really felt absurdly easy to carry around and read one-handed. Yet, it still felt solid, not flimsy at all, just the right weight to feel sturdy but not heavy. The rubberized back had a nice feel to it as well. The other thing I was impressed with was the new page turn buttons and 5-way controller. Some people have complained about the thinner page turn buttons on each side of the K3, and how they depress toward the edge of the device. But I thought they felt great: quiet, just the right amount of resistance, and easy to press while holding it one-handed. Similarly, I was concerned about the new controller pad, which replaces the little 5-way joystick knob on the K2 — the K3’s control pad has 4 directional buttons surrounding a center button, and it looks like you could accidentally press one when you meant to hit the other. But I found that not to be the case, and I never accidentally hit the wrong button or any of the adjacent buttons. In fact, in my limited testing, it felt a little better than the K2’s joystick, which can (rarely) be accidentally pressed in when you mean to move it in one of the 4 directions. Unfortunately, the units at Target are just demo units that aren’t fully functional, so I couldn’t play around with the functionality much or read on it or comment too much on the new e-Ink Pearl screen. Next time, I’ll bring my K2 to compare side-by-side. UPDATE: I visited a different Target and, after resetting the frozen demo Kindle by holding the bottom slider to the right for several seconds, it went into a demo mode where it cycled through 10-15 different screens of info. It also invited me to “Press any button to stop demo,” after which it takes you to the home screen and lets you select and start reading some books, adjust the font size, and generally play around with it. That’s a big improvement from the un-interruptable demo cycle of the K2. Oh, the e-Ink Pearl screen looked very impressive: I still need to bring my K2 for a side-by-side comparison, but the improvement in sharpness and contrast seemed significant. More and more brands of e-book readers are showing up in more and more retail stores (such as Wal-Mart and Target) nationwide. This gives people who may be unfamiliar with e-book readers or the benefits of e-ink a chance to see one hands-on and understand what e-readers are all about. I’ve posted before about various e-readers becoming available in retail stores, but with the recent news that the Nook and Kobo E-Readers will soon be available at Wal-Mart, I’ve decided to make a summary post detailing when and where each of the popular e-readers are available. I’ll try to update this post with new info as it becomes available. I hope it’s useful. Of note, you can view and compare Kindles, Nooks, iPads, and Sony Readers at Best Buy, making it a good choice for a one-stop shop if you’re unsure which one you’d prefer. Most e-book readers are now available in most large retail stores: the notable exceptions being no Kindles at Wal-Mart and no Nooks at Target yet. [UPDATE: Kindles are now at Wal-Mart, which makes it an option for comparison shopping.] 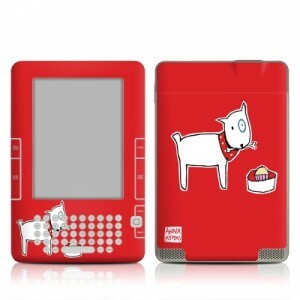 Please let me know in the comments if I’ve missed any large retail stores where these e-readers are available. Target announced today that the iPad will be available in nationwide Target stores starting on October 3. Target will have all 6 iPad models (the 16GB, 32GB, and 64GB models in both Wi-Fi and Wi-Fi + 3G configurations). Pricing will be the same as Apple’s official pricing, although it appears Target store credit card users can get a nice 5% discount on the iPads, starting October 17. 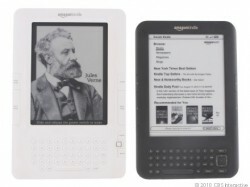 I’ve been hearing reports around the Internet of new Kindle 3 demo units available in some Best Buy and Target stores. While Target has carried the Kindle 2 for a while, it appears some stores now have the new, lighter Kindle 3 in stock. I had also heard about Kindles being scheduled to show up in Best Buy as well, but I didn’t expect them to be available so quickly. I’ve heard multiple reports of the new Kindle 3 at various Best Buy locations around the country (although I can’t say for sure if they’ve arrived at all locations yet). Of note, you can now visit a Best Buy to see the Kindle 3, Nook, the Sony line of e-readers, and the iPad, to compare all the major e-readers in the same place. Two caveats: first, the Kindles at both Target and Best Buy are only demo models, which are set to run through a fixed presentation. So you can see the e-Ink display and handle them to see the size and weight, but you can’t access the menus or play around with it to get the full experience. Second, don’t be surprised if the employees at your particular Best Buy have little or no accurate information on these new Kindle arrivals: the best place for info is still directly from Amazon. Demo unit not functional, indeed. It seems that Kindles in Target’s test locations have been “flying off the shelves,” so Target will roll them out in stores nationwide on June 6. I went by my local Target today (since I’m fortunate enough to be in the South Florida test location), and, sure enough, there was a K2 display on an aisle end cap in the electronics section. 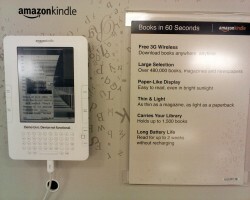 There was a large picture of a huge Kindle alongside a woman sipping coffee and reading, a demo Kindle 2 unit, and a page describing its features (books in 60 seconds, free 3G wireless, paper-like display, 2-week battery life, etc.). Below the unit were several types of cases for the device ($30-$40 each). Unfortunately, the demo unit at the location I visited was damaged: the screen had been cracked (note: the pattern you see in the above photo is indicative of the Kindle’s screen cracking on the inside). For some reason, this made me kinda sad, as it hardly seems like they’re putting the Kindle’s best foot forward with a display with a broken unit, which is not only useless (and ugly) to look at, but reminds potential buyers that you do have to be more careful with a Kindle than with a paper book. That scene in Modern Family where the kid sits on Al Bundy’s Kindle and breaks it didn’t help either! On the plus side, all the Kindles at the location I visited were sold out (though they did have stock at other nearby locations). It also appeared that several of the cases were sold out as well (there were stickers and spaces for 6-8 different types of cases, but there were only 4 cases of 2 different types remaining). Target announced yesterday that Amazon’s Kindle 2 will arrive in select Target retail stores on April 25. This is big news for e-readers in general, and the Kindle in particular, since it was only previously available online through Amazon.com. E-readers are a new and still unfamiliar technology, and there are many people who would be wary of spending $259 on a device that they couldn’t see and touch before purchasing (even though Amazon offers a no-questions-asked 30-day return policy on Kindles). Everyone I’ve shown my Kindle to has been impressed, some even amazed by the technology, readability, and light weight. So I think getting the actual product in front of millions of customers will only be a good thing for Kindle sales. Unfortunately, the “select stores” that will initially get the Kindle 2 are Target’s flagship store in Minneapolis, as well as 102 stores in South Florida … which is where I happen to live. 🙂 Hopefully they will expand the availability nationwide soon. Another note: it is currently rumored that the Kindle may also be coming to Best Buy. That would be interesting, since Apple’s iPad, Barnes & Noble’s Nook, and Sony’s e-Readers are already available there. That would make Best Buy a great one-stop-shop to try out and compare the various e-readers available. Of course, the Nook is already available at most Barnes & Noble stores, and is similar enough to the Kindle to give customers an idea — especially the 6″ e-Ink screen, which is identical on both devices.